Published in Rafu Shimpo, May 18, 1950, Japanese section. 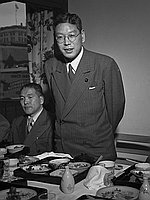 Japanese Prime Minister, Hayato Ikeda, arrives at Los Angeles International Airport (LAX) and is met by the Hiroshima Kenjinkai, and speaks at a restaurant in Los Angeles, California, May 17, 1950. 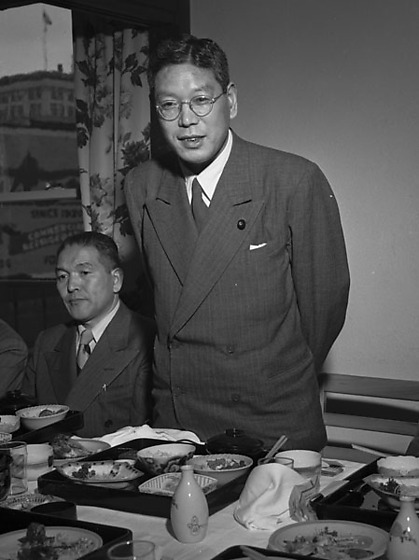 Includes Hayato in double-breasted suit and eyeglasses being greeted by men in suits at LAX, including Jiro Shirasu (neg1 and 4 published); and he speaking to men gathered at food laden table at a party. Typed on original negative envelope: Prime Minister Ikeda Arrival at LAX.